Renaming files is not working before you download or add it to the queue. I had reported this earlier. It was possible in the stable versions. I think the problem here might be because the download starts even before you click the OK button. 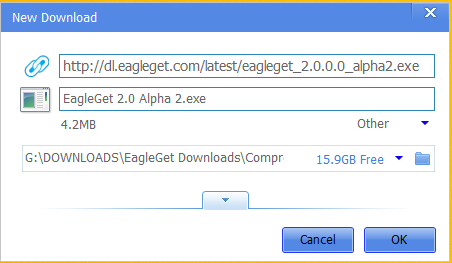 I tried to rename the EagleGet download from the forum, to EagleGet 2.0 Alpha 2 as shown in the picture, but it didn't work, instead it was named as eagleget_2.0.0.0_alpha2. How long before the stable version is released? • Adding Configurations button to the toolbar. • Adding Export/Import options to the context menu in the task panel. • Adding tool tip to every single button and link in the UI (eg. Pause/Resume, Open File ... etc.). • Adding a "Reset" button to the skin panel. Actually i have lost idea on EG UI in this alpha vesion which seems blur and not attractive to me (personally). for the moment i will just wait and if EG keep this UI in the future i got nothing to say. i will continue use EG solely only because of its superior performance not for its UI same just like IDM nothing more or less . 1. plugin adding code to webpages, and when page is saving the code will be in saved page. 2. a plugin for each tab will add noise and messy to browser. I hope Download Button could be moved around (drag whenever you want on web browser) because sometimes it covered the media player on the web. Works well, but i get an issue. BUT! It works when i installed firefox ! Without using it. Since cyberfox is a firefox based browser, maybe it needs firefox.exe installed for being integrate well on cyberfox, i don't know..
Out of curiosity and lack of knowledge, how did you add the extra buttons on the UI to convey your ideas? Is there any software that helps you do that, or did you design in Photoshop? yeah im also curios what how did you design this UI? How long left now? Unfortunately I had to go back to IDM for the time being because EagleGet wasn't picked up my downloads from sites requiring a password. Thanks, Karnivore. I cannot answer your question, but please open a thread in Report Bugs forum and tell us what version of EG, Windows and Windows you are using and post some URLs to test. If you are using EG 2.0, then go back to 1.1.8.3. 2.0 series is just for testing only at this time. If you are using Firefox 30.0, you will need to use another browser. Enjoy, John. Thanks, cornkorn. Please post this in the Feature Requests forum so the developers will consider it. Enjoy, John. when will the final version be released ? Thanks, dani alcatraz. At this time, I suspect that is totally unknown. Enjoy, John. There are beta and RC versions yet to come out, so it might take some time. I hope we'll be looking at a September release, coz i'm really excited. The developer will let you know.. Kicking the tires on 2.x Alpha. I am trying out 2.0.0.5 Alpha 4. I agree with those who say it should be called "2.0 Alpha 4". The name "2.0.0.5" implies a very minor bugfix to an already released 2.0. I have a problem with the Configuration/Notification options. I cannot unselect the last two options to display a pop-up and play a sound when a download is completed. I notice that this tryout version does not have a "Video Sniffer". That's no great loss because the one in EG 1.x doesn't do anything useful anyway. I saw the "bug reports" topic, but I don't think that's the appropriate place to comment on an Alpha product. It should be reserved for bugs found in the latest stable release. Thanks, Neil_P. The Report Bugs forum is the proper forum for 2 Alpha bugs. You can start a new thread or reply to my thread or other 2.0.0.5 (my preferred name) threads. I am doing maintenance on my VM (VMware Player, where I do testing) so I cannot test right now but will test soon (Configuration/Notification options problem). The video Sniffer has not been implemented in the 2 Alpha series. If works just fine and quite well in 1.1.8.3 after the fix is applied (please see here). It only works works on YouTube. Enjoy, John. EDIT: You are correct, the last three settings cannot be unchecked, but if your Enable "Show all popup dialogs" the three options below can be disabled. You should have implemented video sniffer in alpha. It would have helped in its improvement and bug fixes.